I went to the Airshow this weekend. The Airshow is something I think everyone should check out at least once in their life. It is pretty amazing to see some of our military jets peforming special maneauvers. It's the very least people can do to show support for our armed forces. The show displays different aspects of the military and how jets are used for special functions. I've heard people use the excuse you've seen one Airshow you've seen them all. I started to beleive this philosophy. 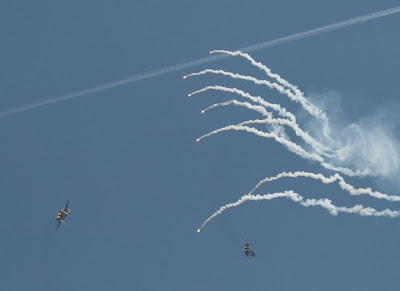 This Airshow put those theories to rest. There was a small dramatization and re-enactment of Pearl Harbor. 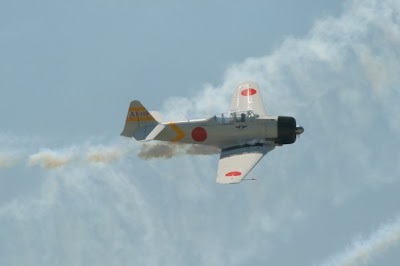 I've never seen Japanese Zero's fly so it was pretty neat to see them. The re-enactment was bitter sweet. It was cool to see the planes fly and watch the explosions but hearing the announcer go over the horrorifying events that happened during Pearl Harbor was emotional. There was another demonstration that I've never seen before. 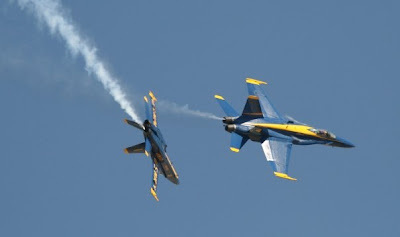 There was a combined air combat demo. F15's and F16 simulated a air combat. The F15's launched real flares. I've never seen this before. It was pretty amazing and added another element to the awesome flying. The end spotlighted on the Blue Angels. 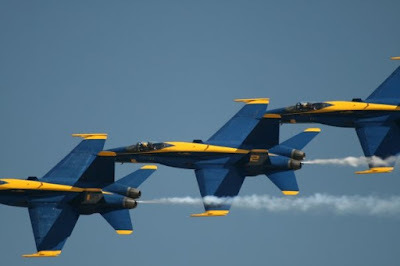 These were the main superstars of my airshows back home in San Diego. They flew basically the same show I've seen before. I never get tired of it. They never disappoint to entertain. This flight focus's on the technological advances of the airforce. 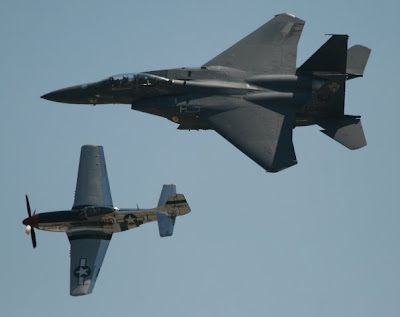 The P51 and the F15. Obtaining air superiority for over 40yrs. If you haven't gone to an airshow, I can't recommend it highly enough. I decided to try the pond near work again today. I didn't expect much because we've had recent storms. I decided to stop by Bojangles before heading over. Preston called me while I was waiting to get my food and said two carp were feeding in the shallows. I quickly made my order to go and scarfed down my cajun filet biscuit on the ride back. When I went to the pond the water looked calm and I couldn't see any activity. Preston said he thought the carp may be gone. I rigged up a nice olive wooly bugger making good use of the Orvis $10 20fly selection I bought recently. There was a nice film of pollen on the water which made the clarity horrible. I could see what looked to be a carp in the shadows but couldn't make out which way it was facing. Finally it showed itself in the sun. I made a decent cast but it didn't seem interested. While trying to make another cast my line got tangled in a tree behind me. While getting it loose I saw another carp swim right by me close to shore. I held still and watched as the beast came into the shallows and slowly disappeared in the murky water. The pollen seemed to be disguising me and these carp seemed hungry. I made several casts to the looming shadows that would show themselves here and there. Preston saw a fish in the shade and I made my cast in that direction. A few quick strips later my line jerked and severe tension was put on my 5wt. Here was my next dilemma my 5wt has a broken crank on the reel. So I have no way to play the fish on the reel. I tried using my palm but watched helplessly as my line descended further and further down my rod. It took less than a minute to get to my backing and within another minute the backing STOPPED! I had nothing left, I tried feverishly to wind the reel slapping it with my palm since there was no crank to wind the line back in. Eventually I was like screw it and started stripping line with my hand. I was able to find a happy medium of stripping line and letting it slide threw my hand and the rod. I saw my backing come through the guides then my line. I breathed a sigh of relief but I still had to get this monster over to the bank. The rest of the fight that in sued is in the video below. Last week I took a few days off and headed up to Boone for a long weekend and some quality time with the family. The dilemma was where to fish. It was spring break and I figured the hatchery supported streams would be hammered. The DH would probably be pretty crowded as well. Not on a weekday, so that was an option. I decided to go with a stranger alternative. Try the New River which was basically wild fish. I headed to the river with low expectations. I've never had an incredible fishing day there. I gathered my gear and made my way to the river. I was pleasantly surprised by not only the water clarity but the water level. It was higher than I remember. Some renovations had been done to the banks to prevent bank degradation. I figured this section would be void of fish and I was correct. 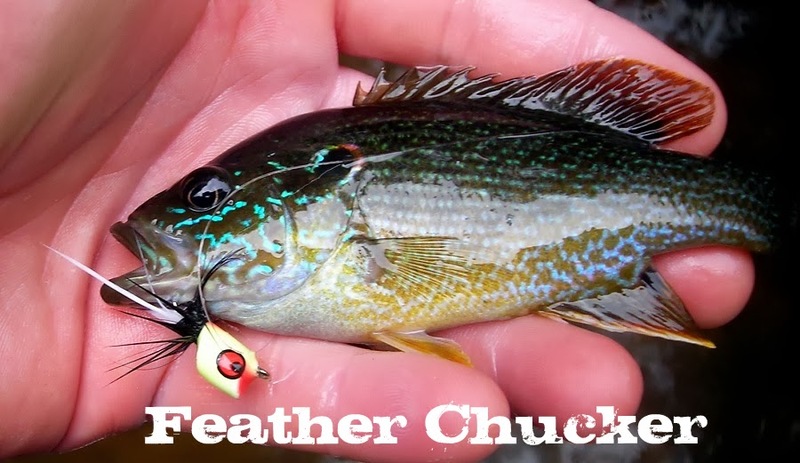 I worked my way down stream and found some runs that looked perfect for holding fish. I didn't get a hit or see a flash. I started to think maybe this stream was dead. The sun started to really beat down and the air temperature warmed considerably. I continued to make my way down stream and I noticed more and more bugs hatching off the water. As I made my way to one fast section I could see fish hitting the surface here and there. I worked my way down and watched them for awhile. They were hitting pretty consistently. I couldn't tell what they were hitting. I tried a caddis and received a few hits but I couldn't keep a fish on. I worked further down stream. Now bugs were coming off even more and the surface action was getting intense. I caught a few bugs that flew past me in my hat. Two gray caddis. They were fluttering everywhere. It was one of the best hatches I've fished in. Fish were in a frenzy and rising about every 30seconds. I cast my caddis to where I saw the rises and instantly had a hit. I still could not keep the fish on. I figured my liter was too long. I shortened the leader and kept after the rising fish. I eventually caught a nice 6inch bow. I was so proud of myself. My day was made. It wasn't over though. I continued to catch fish throughout the day. The fishing just got better and better. I ended up landing about 5 fish. I had on and fought at least 10 that got away. I had forgotten how feisty wild fish are. They did every trick in the book, they would run down stream, jump at least 3 times and still wouldn't give up once they got near your hand. I left the river energized and happy to have a great start for the weekend. I went back to the river on Sunday, It was nothing like the day I had just a few days prior. No surface activity, it was a lot colder and there was not as many bugs flying off. The river looked like it was lifeless. I knew the fish were there but they were not hitting anything. I eventually went back to the caddis and managed one fish. It was a reminder to cherish the really great days that seem too good to be true. I was introduced to someone by a friend and was told she wanted to learn fly fishing. I was happy to teach her, but I forgot what it's like to not know anything. She had hardly any experience fising at all let alone fly fishing. What I learned by teaching her was all the things I took for granted I learned through the years. Reading water, knowing where to cast,line control, knot tying, reading water, fly action, seeing fish. We went to Milbourne Dam to see if we could get into some shad. It had rained a couple days before and the water was really high. Too high to do any effective fishing. 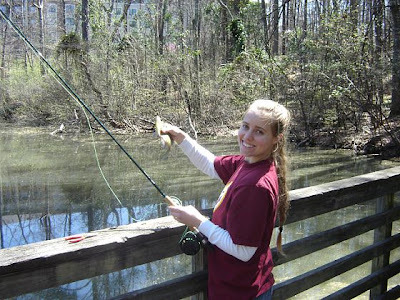 This was the 3rd time fishing with Jen and I was determined to have her catch a fish. We had been skunked the other two times we went fishing. 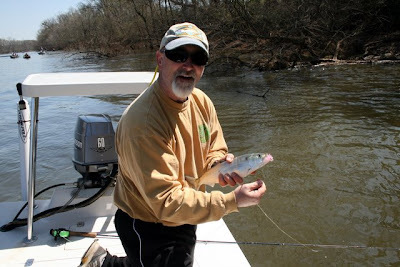 We did find a small creek off the Neuse river where I spotted some fish in the shadows. I showed her the fish and pointed them out the best I could. No matter what I did she could not spot the fish. I then tried to instruct her to get into the best position for a cast. She tried a few casts but couldn't get the fly into the target zone. Eventually she hooked a branch and I had to walk down and free the line. I wanted to show her where to cast, so after a few flicks the fly landed in the spot I wanted and after a few twitches a fish was on. Jen was more excited then I was. It was then I realized how much of a fishing snob I became. I forgot how to just have fun fishing. Before I caught the fish, I kind of felt like this was trash fishing, we were fishing a drainage into the Neuse. I felt like we could catch some fish but it wasn't "real" fishing. What Jen showed me by her reaction was the enjoyment I had forgotten. When I was yonger it wasn't about a "fishing experience." It was about catching fish, even if that meant fishing in gross drainage puddle next to a creek. It's fun to "catch" fish no matter the place. We left the Neuse and headed to a place I've been wanting to take Jen for awhile. It was a park in North Raleigh I visited a few times when I lived there. I never fished it but I saw fish often when I hiked there. We hiked to the lake and the weather was amazing. Sunny, blue skies and the temperature was in the 70's. We arived at the pond and I could see shadow suspended on the surface. Jen still had a hard time picking fish out. I had her cast a olive bugger and instantly a bass came up and tried to smash it. Jen was a little slow in hooking it. I knew it was only a matter of time before she caught a fish. After a few more casts she had her first fish on. A nice feisty blue gill. Pretty good size too. The look on her face was pure excitement. 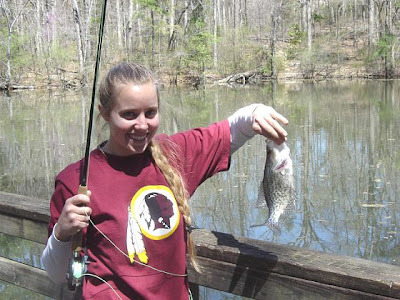 She was so happy about catching the fish, I thought she was going to keep it and take it home. We through it back and went after another one. It wasn't long before she had another fish. She started to catch on to casting better and spotting fish. It was really fun to watch her put everything together. I had more fun watching her than fishing myself. The highlight of the trip was her catching a nice crappie. It was one of the biggest I've seen. Bigger than any crappie I've caught. We decided to call it a day. I'm pretty sure she is hooked and before we left that morning she told me she had wading boots on the way. I look forward to our future fishing adventures. It's interesting how the actual catching fish part is secondary. It's just nice to be outside on a beautiful day. Have conversations with a friend, cast a few lines and not even know really what you talked about. But you know you had a good time. I finally had my Weldon Shad Fishing Experience. I have heard about this place for years and was eager to try it. Preston recently got a sweet flats boat and this was it's maiden voyage. It's been out on a lake a few times but never on an official fishing trip. We got on the water at about 11in the morning, apparently the water was about 15ft or so above normal. 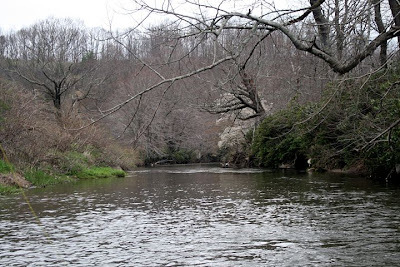 The Roanoke River reminded me of the Neuse. It's color was a murky brown with a visibility of about 2ft. We started hitting the banks casting here and there. We talked to fisherman as we passed. A few had caught some, but more said they had been skunked. We came to a spot where we saw one boat catching fish consistantly. We threw various flies but Preston was the only one who managed to hook up. We started to try a different spot when the boat sputtered then died. I saw the look on Preston's face that said it all. Our fishing trip was most likely over. After several attempts to restart the boat we decided it wasn't gonna start, dropped anchor and waited for someone to give us a tow. We ran into a Guide we had previously used to for a Red Drum fishing trip. His name was Dean Lamonte. He was nice enough to get contant another boat with a big engine to tow us up stream. It was a dissapointing way to end the day but I'm glad we got to fish for a couple hours.